This release adds support for downloading for downloading directly from the Canon EOS 7D and Canon EOS-1D Mark IV. This release also includes the following improvements when downloading images directly from recent Canon EOS cameras: faster download speeds, now creates THM thumbnail files when downloading movie files, supports very large files (e.g. movie files larger than 2GB). European Union customers are reminded that there will be an increase in the VAT (value added tax) charged when the British goverment changes the VAT rate from 15% to 17.5% on 1st January 2010. Customers planning to buy photobooth and remote capture licences are also advised that the cost of licenses for these applications will increase from 1st January 2010. To beat these changes please ensure your order is placed before midnight UK time on the 31st December 2009. The new prices (excluding tax/VAT) for remote capture applications will be US $129 for DSLR Remote Pro for Windows, DSLR Remote Pro for Mac, NKRemote and DSLR Remote Pro Multi-Camera (per camera). PSRemote and PSRemote Multi-Camera (per camera) licences will be US $95 (excluding tax/VAT). Upgrade licences cost approximately 50% of the purchase price and will be increased accordingly. Prices in Euros and GBP will be changed in line with the currency exchange rates on 1st January 2010. These releases add support for the new Canon EOS 7D including live view display, timed bulb exposures and the ability to save images to the camera only, camera and computer or computer only. When saving images to both the camera and the computer the same filenames for images can be used for images saved on the computer as for images saved on the camera's memory card. DSLR Remote Pro for Windows also includes enhancements to photobooth shooting mode by adding more flexible touchscreen options and the ability to switch between different sets of photobooth settings. The keyboard shortcut Ctrl+R has been added to allow easy reprints of the last photobooth sequence. DSLR Remote Pro Multi-Camera v1.3 adds support for the Canon EOS 7D. This release also allows multiple cameras of the same model (or different models) to be controlled on PCs running Windows 7, Windows Vista or Windows XP. These releases enhance the photobooth shooting mode by adding more flexible touchscreen options to photobooth mode and the ability to switch between different sets of photobooth settings. The keyboard shortcut Ctrl+R has been added to allow easy reprints of the last photobooth sequence. Canon Pro Photo Solutions 09, 27/28 October at the Business Design Centre, Islington, London. Breeze Systems shared a stand with Timeslice Films at the show and demonstrated a bullet time rig with 55 Canon EOS 450D cameras. The cameras were controlled by DSLR Remote Pro Multi-Camera and the camera mounting, triggering and image post production work was done by Timeslice. You can see video from the show on the Timeslice website. These releases enhance the photobooth shooting mode to allow custom print layouts where the size and position of each image can be specified individually. This makes it easier to design complex layouts and allows different sized images to be printed. Photobooth settings can now also be loaded from and saved to disk making it easier to switch between different photobooth settings. 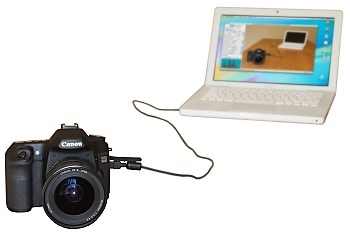 Mac OS X based software to control Canon DSLR cameras from an Intel Mac. 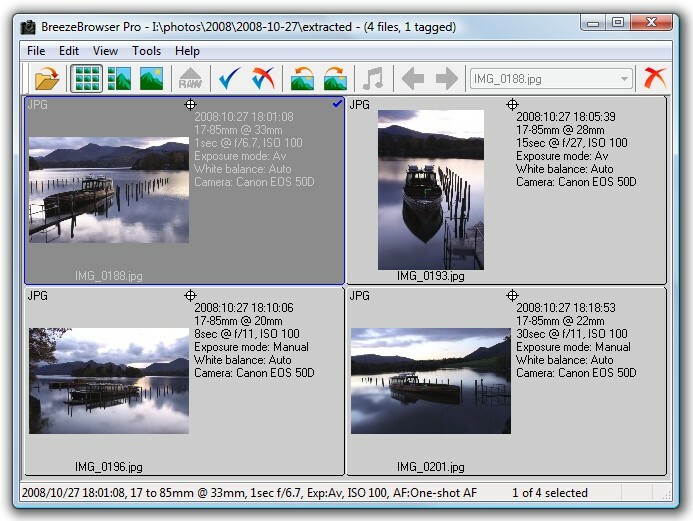 Breeze Systems' highly regarded software has been used to control Canon cameras on Windows since 2001. 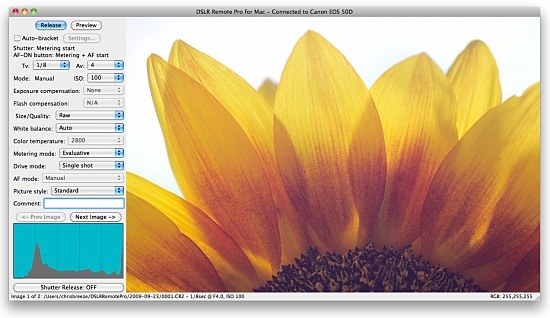 DSLR Remote Pro for Mac 1.0 beta 1 is the first public beta release of software for controlling Canon DSLR cameras on a Mac and currently supports the Canon EOS 50D, Canon EOS 5D Mark II, Canon EOS 500D/Rebel T1i, Canon EOS 1000D/Rebel XS, Canon EOS 450D/Rebel XSi, Canon EOS 40D, Canon EOS-1Ds Mark III and Canon EOS-1D Mark III. Update 6 August 2009: beta 2 now available with support for Canon EOS-1Ds Mark III, 1D Mark III, 1Ds Mark II, 1D Mark IIN, 1D Mark II, 5D Mark II, 5D, 50D, 40D, 30D, 20D, 1000D/Rebel XS, 500D/Rebel T1i, 450D/Rebel XSi, 400D/Rebel XTi, 350D/Rebel XT; updated help files and fix for possible crash at startup when auto-reconnect is enabled. This release adds support for downloading .MTS movie files and for downloading directly from the Canon EOS 500D/Rebel T1i. This release also allows the artist and copyright fields to be edited for recent Canon EOS camera models. This is a minor update which adds support for Pentax K200D raw conversion, fixes a problem converting Canon Rebel T1i raw files and adds optional renaming when converting raw files. NKRemote v1.1 adds support for the Nikon D5000. BreezeBrowser Pro v1.9.4 adds support for Canon EOS 500D/Rebel T1i and Panasonic DMC-FZ28 raw conversion and enhances the thumbnail display with optional shooting data and GPS icon. BreezeBrowser Pro runs on Windows and is available on a 15 day free trial from Breeze Systems' website. BreezeBrowser Pro v1.9.4 is a free upgrade for all registered users who purchased a license within the last year. BreezeBrowser users and users who purchased a license for BreezeBrowser Pro before 21 May 2008 please see the upgrade page for details on upgrading.